Remember one of our cardinal time-saving tips? Any time you cook beans, cook enough for three different meals, three different recipes. It just takes a little planning. No big deal! 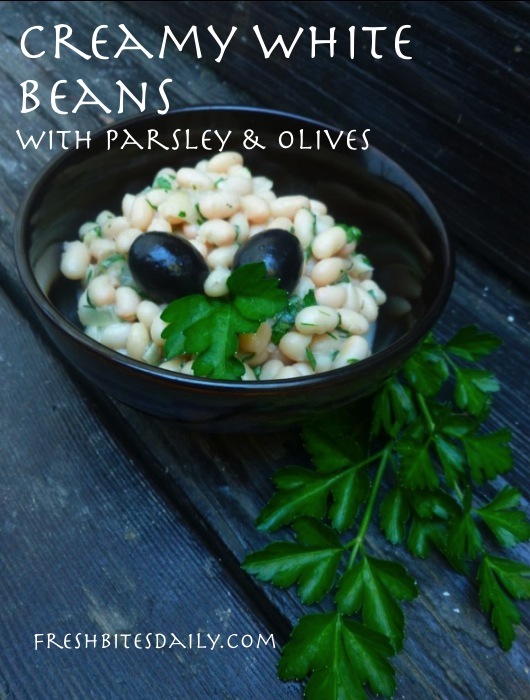 This white bean dish is so quick and simple you will be making it often. The beans are already cooked in broth and seasoned, so they are already tasty. You will add just enough to the beans to turn them into a gourmet side dish. You do not have to tell anyone these are from the same bean pot as the beans in the Italiano soup you had two nights ago. Our secret! Use Italian flat-leafed parsley rather than the curly type. Curly is too bitter for the delicate flavors of this dish. Add more or less parsley than the recipe calls for depending on your own palate. Heat the beans to a simmer in the 1 cup of broth. Allow them to simmer over low heat for about 10 minutes. Mix the thickener with the cream and wine (if using wine). Blend well to break up any lumps. When the beans have simmered for 10 minutes slowly add the cream mixture in a thin stream, stirring the whole time. Bring the beans back to a simmer. The sauce will have thickened by the time the beans reach simmer. Remove from heat. Stir in the parsley and lemon zest. Taste for salt and pepper. Make any necessary adjustments. Let the dish sit for 10-15 minutes before serving to give the flavors a chance to develop. Serve the beans garnished with black olives, sliced or whole. This dish is good warm or at room temperature, making it an all-season side dish that you will turn to often. Try it in the summer at room temperature served beside grilled chicken and sliced garden tomatoes. Does that idea make your mouth water? In winter enjoy this bean dish warm with meatloaf and a crispy green salad. Creamy white beans keep well for 2-3 days in the refrigerator as long as they are stored in an airtight container. 1 Comment on "Turn your white beans “gourmet” with these simple ingredients"
This one looks really easy to prepare. This is perfect also for the fasting season.